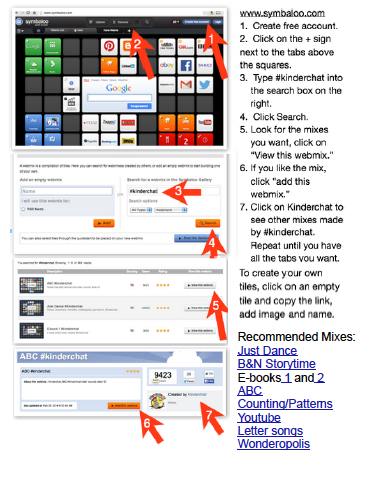 One of my favorite free apps that I use every day in my classroom is Sketchio (available only on the iPad). Android users there are drawing apps (I use one called Drawing) you can use in place of Sketchio. What I love though about Sketchio, is that students don't have to erase if they have run out of space. With Sketchio, they simply go to the next page and continue writing and I can check ALL the work they've done. AND, no smelly, dried out markers!!! Last week my students were working on beginning, middle and ending sounds. I asked them to write B M E at the top of the page and two lines separating them. Then I dictated words and they separated the sounds. If the students get the spelling wrong, they simply copy the first student who gets it correct (which I show on the board). Please click on the link and complete the survey. Thank you! Thank you for joining me in seminars this week in Illinois, Michigan, Wisconsin and Ohio. My husband has taken over the Samsung to play his games on... I will continue to steal it back occasionally to keep exploring. I do like that you can have profiles and a kid friendly profile as well. There is a lot of talk about what is appropriate practice for early childhood classrooms- with the hot seat focus on Kindergarten. There are more and more expectations placed on schools to have children reading, writing and fluently adding and subtracting before first grade. All skills at used to be TAUGHT in first grade. The emphasis has affected kindergarten curriculum- there are more and more worksheets and skill practice than ever before- and yes, it's happening in preschool too. I've even seen worksheets in toddler classrooms! Right or wrong- can you tell which side I'm on? !, worksheets are often part of purchased curriculum. Some schools require them. And yet, they are not necessary or even beneficial to learning. There are many ways to practice skills in more engaging, memorable, developmentally appropriate ways while meeting learning goals, such as those found in CCSS, the Common Core State Standards. I had the privilege of working in two kindergarten classrooms and observed the same concept being taught in both rooms. 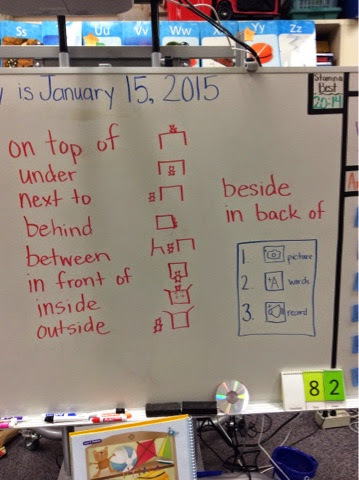 The students were learning positional words, such as in between, above, under. CCSS KGA1. Describe objects in the environment using names of shapes, and describe the relative positions of these objects using terms such as above, below, beside, in front of, behind, and next to. 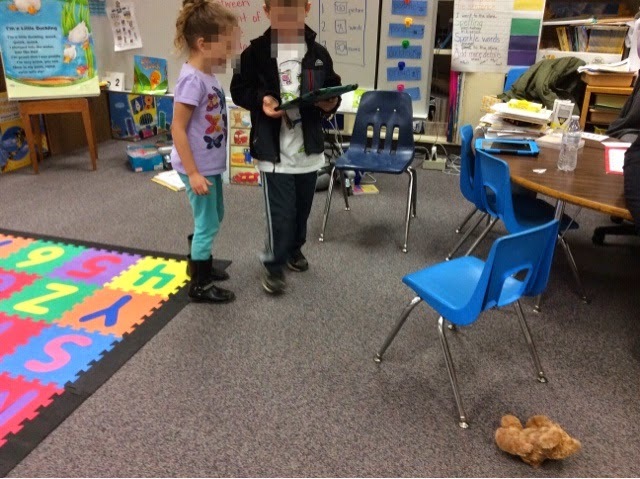 The teachers talked to the students about the vocabulary, and demonstrated with objects. The lesson had an accompanying worksheet page- the students were supposed to listen to the teacher give directions to draw a line from an object to a location. A pencil to the 'top of the table' or a book 'under the chair'. 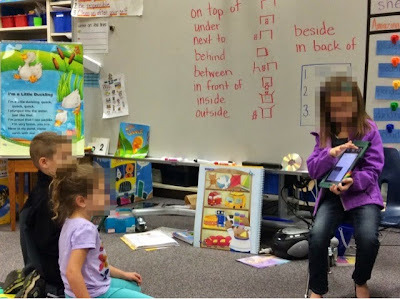 Instead of using the worksheet I suggested to one of the teachers that we have the students use the iPad to work on the skill and helped by giving a mini-lesson on using the iPad to create an e-book using positional words. CCSS WK6. With guidance and support from adults, explore a variety of digital tools to produce and publish writing, including in collaboration with peers. Using StoryKit (a simple free iPhone app that allows drawing/writing, typing, adding photos and audio recording) the students used a classroom toy and took a picture of it in relation to other objects. Then they typed the positional words and dictated using the audio recorder the position of the objects in a complete sentence. CCSS WK2. Use a combination of drawing, dictating, and writing to compose informative/explanatory texts in which they name what they are writing about and supply some information about the topic. We showed the students to put their names and photo on the first page. We discussed the role of author and illustrator/photographer. CCSS KRI 6. Name the author and illustrator of a text and define the role of each in presenting the ideas or information in a text. First I did a mini lesson to demonstrate the importance of perspective when taking photos so that the readers can see the actual position of the objects. 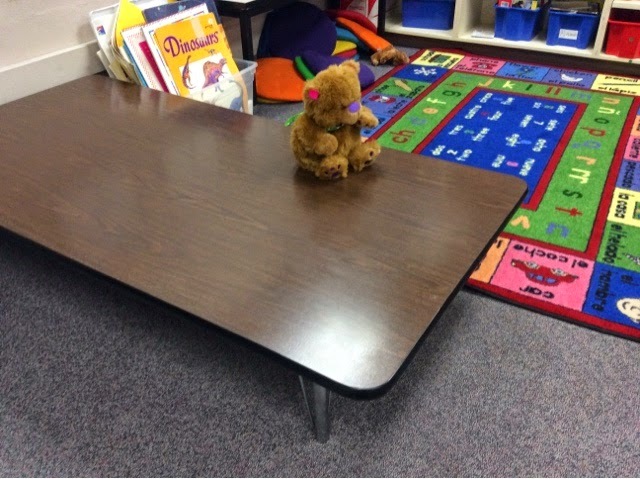 In the first photo you can tell the bear is on top of the table, whereas in the second the bear could be anywhere. Mrs. Ford demonstrated how to type the positional words. We wanted the focus to be on the concepts not writing, so other than copying the positional words, they didn't need to write anything else. A simple picture (the blue box) showed the kids the expectations (1. Take a picture, 2. 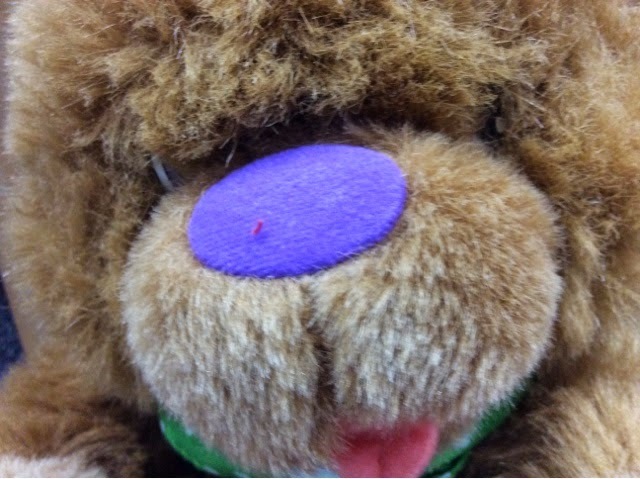 Add positional words 3.. Record the position of the toy in a sentence). We asked them to try to demonstrate each concept, taking turns making a page. CCSS SLK5. Add drawings or other visual displays to descriptions as desired to provide additional detail. CCSS SLK6 6. Speak audibly and express thoughts, feelings, and ideas clearly. 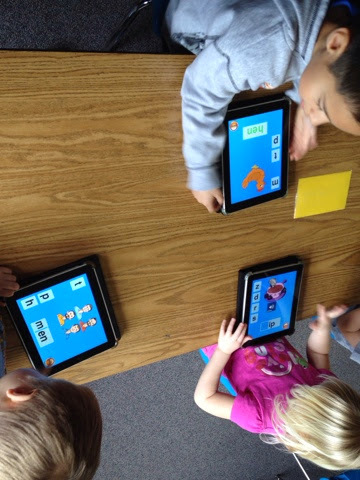 The students worked in pairs since we only had 6 iPads and took turns demonstrating the positional words. They then shared the resulting 'books' with their other classmates, reinforcing the concepts and practicing their public speaking skills. The books can also be read and reviewed later in the year. The project turned out very well. It was the first time the students had used the iPad to create an informative text and it was very successful! 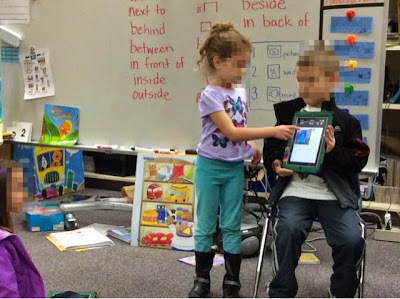 For the apps that don't allow you to share the end result easily I usually just video record the presentation (see a video made during this activity at my Facebook page facebook/adigitalkindergarten) and upload to Youtube. I like Stories and StoryKit don't have ways to share the books, but the video works well. Think for a minute about how you're already using your computers or tablets for writing and reading practice. Do your students only use apps or webpages? There are many great free and paid apps I could recommend you use for reading and writing in your classroom. This post isn't about them! Instead I'm going to share some simple ideas for using your device's built in features and apps for center work; in my classroom I call it word work. Use 'Contacts' for a built in classroom dictionary/thesaurus. A colleague shared this idea with me- and I was blown away by its' simplicitly. Open the built in contacts app or address book (on most devices). If there are already entries in your contacts, you'll need to go to settings, and then accounts, and turn off the accounts that are associated with the contact app. Your Contacts should be empty now. Enter (or have students enter) your sight words/spelling words/vocabulary as they are introduced. Then, during work time students can write them in alphabetical order, use as a reference for spell checking their writing, or for spelling practice. 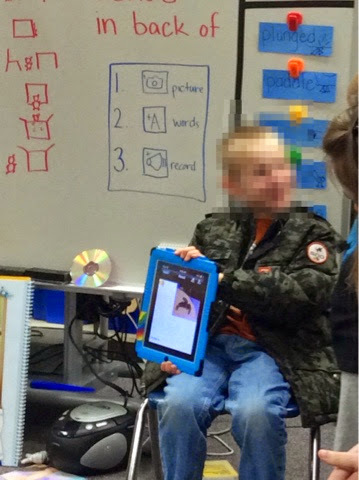 Add pictures saved from the web (or pictures drawn by students in another app) to illustrate the word list. 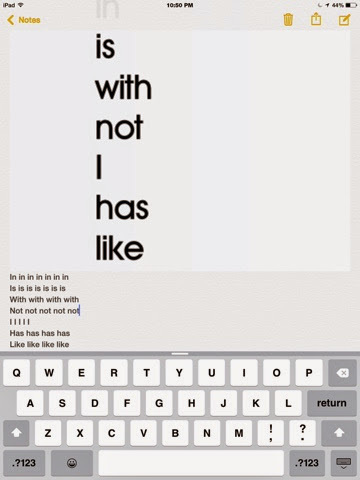 On the iPad students can type the words directly into the note section. Students or the teacher can also write a sentence using the words in context into the notes section. Add student names and pictures so students can correctly spell classmates names. You can also add building staff and pictures/names the children bring in (or have parents email to you) of their families/pets so they can write using those correctly spelled. Add any words the student consistently misspells. Do you have a print rich environment? If you're not already having students 'Write the Room' it's an easy word work center to create and maintain. If you already have students do this, add using your device's to the center. In my classroom I have 6 clipboards (attach a pencil to the clipboard using yarn and tape). The students walk around the room and write words they see. It might be off the word wall, posters, anchor charts, books, cubbies or desks, etc. 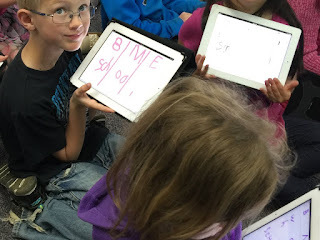 Spice up writing the room using devices! This activity involves mobility so it's suggested to use with tablets, not laptops, of course! However, laptops with a camera CAN be used with your traditional write the room center. Once the students have written their words, they can use the camera on the laptop to record a video of them reading the words. 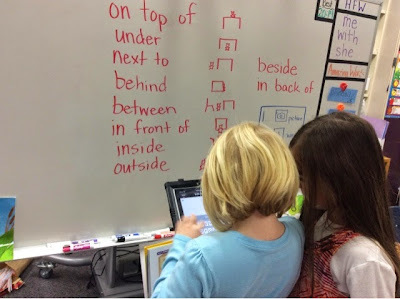 Or, after writing the room, they can type up the words in a word processing application or use them in sentences. Using the tablet students can type sight words/spelling words they find right in the built in notes app. Many of the note taking apps have the ability to insert or take photos too- they can write and photograph where they find the photos. 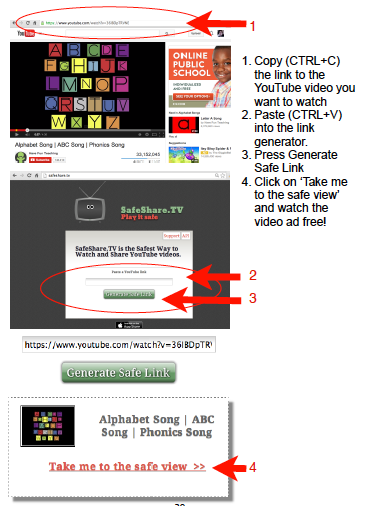 They can email you or their parents the note if you've entered the emails already. If you want them to still write the words on paper, have them take pictures of the words they write on the clipboard to show where they found it. Review the words in group time (or have them share with partners) for additional review. An alternative to write the room is read the room. As students move around te room looking for the words they can read have them take pictures of the words. 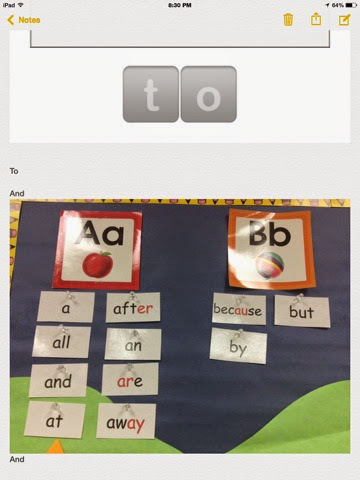 Have students focus on sight words and find the same word in four different places/fonts (walls, books, posters) and snap pictures. Or, they can read the room and video record their voice as they read the word. 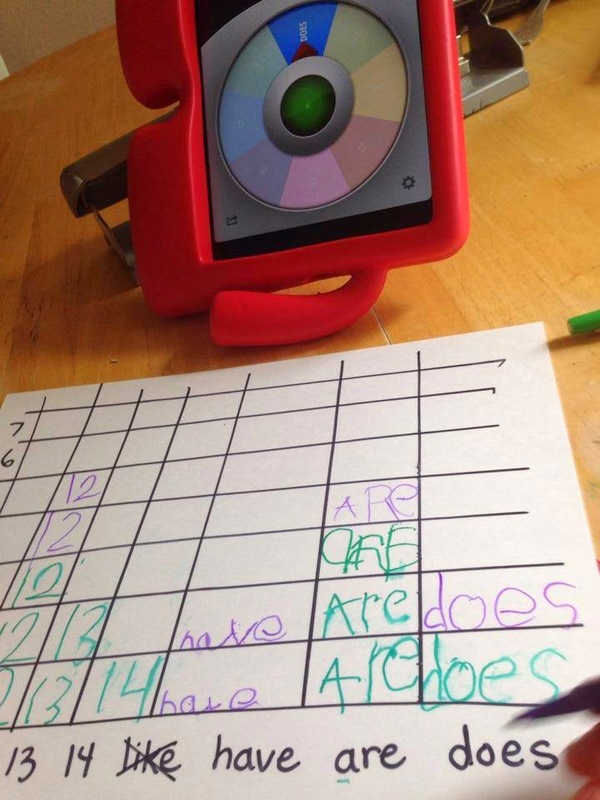 Have lists of sight words, cvc words, spelling words, phrases or books for students to practice their reading fluency. 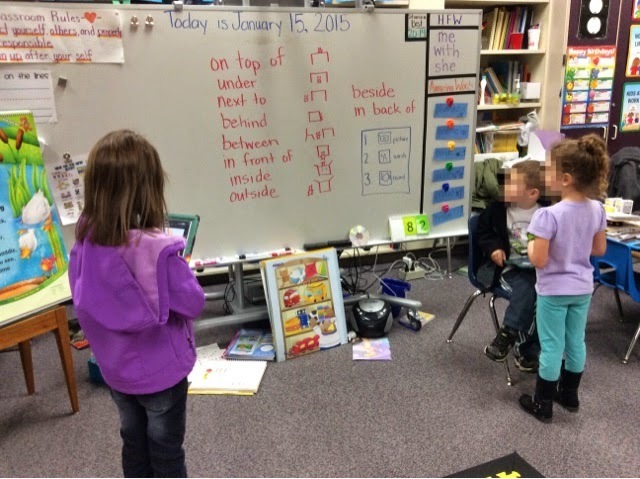 Students can record themselves or a partner reading, replay to listen and self evaluate. Then they can rerecord. Teachers can record themselves reading too: have the student read with the recording. Read and record slowly and then faster and have students read along as they listen. Many beginning writers struggle to use 'fingerspaces'. I've used all the usual strategies with the few who still forget by January and don't use them. I will always remember the first time I used typing as one of my strategies... And it worked! One of my students who just didn't get it no matter what, finally had it click. I asked the students to type a simple sentence using sight words and asked her to reread what she'd typed. She wasn't able to read it of course, so then I pointed out the space bar, its size and together we went back and added the spaces and read her sentences. I am Olivia. I am six. I like my mom. I love my dad. She was SO excited to be able to read her own writing, and the learning transferred from typing to writing. Ever since, I point out the importance of the space bar and get the kids typing earlier in the year and I've noticed a huge improvement in use of the spaces. Have kids take a picture of the word list they need to work on and type them up in the note taking app or in a word processing program. Look cook took look cook took look cook took. The repetitive nature will help them memorize the words! Do you do Making Words lessons with moveable alphabets? Have the students use their note taking app or a word processing program to follow along in a small center or whole group. If you're doing it as an independent center have a recording of you leading the lesson and they can type the words as you go through the list. 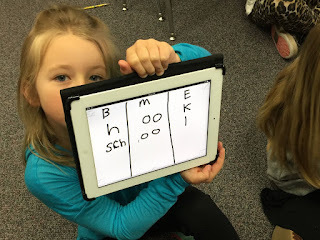 Using a handful of letters students manipulate them to create words the teacher says a word, uses it in a sentence and then the students type or move tiles to make the word. Spell the word at. I am at school. At. Now add one letter to spell the word mat. I sit on the mat. Mat. Change one sound to make the word map. Find my city on the map. Map. Change the letters around to make the name Pam. Pam is my friend. Pam. 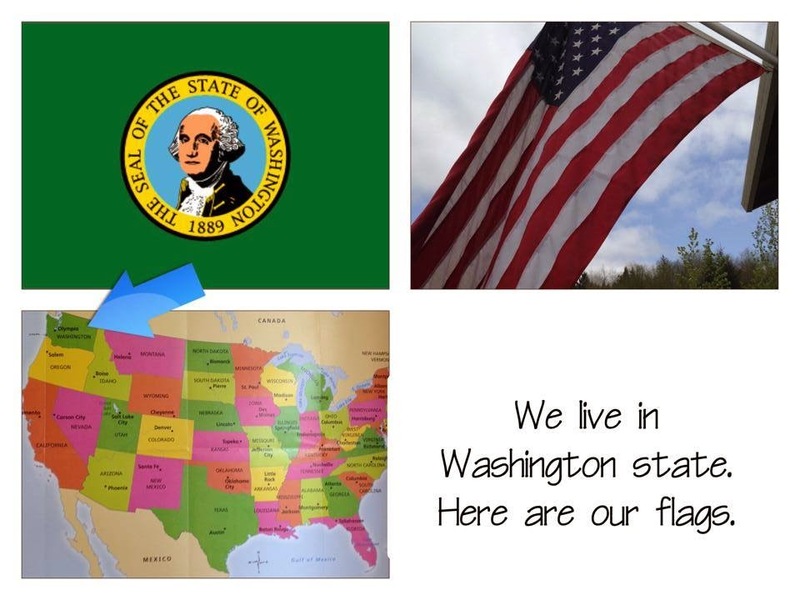 And so on... Making word lessons are so powerful for students in K-2. Be sure to look up Patricia Cunningham's books, Making Word Lessons for ready made lessons and more support on getting started. 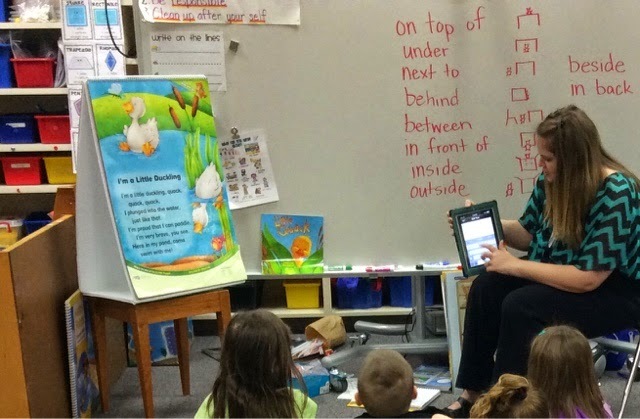 Have an idea to share of how you're using your basic technology to practice literacy skills? Comment below! I am frequently asked "What about other Tablets? Chromebooks? My district just bought us tablets but they're not iPads. Can I still use them to teach my students?" YES! While I am biased towards using Apple devices after years of using them professionally and personally, any mobile device can still help you enhance and even transform your teaching and student learning. Not all devices are created equally though. There are pros and cons to any device- primarily their capabilities, apps available, and cost. I still encourage schools embarking on a new mobile technology journey to seriously consider adopting the iPad. 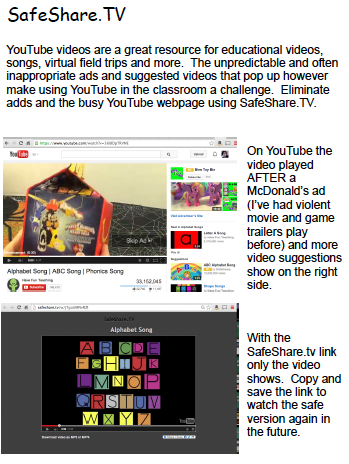 The higher (sometimes) cost pays off in quality and cost of the apps available, especially for primary grades. If you or your school has already invested in a non-Apple tablet or laptops, don't worry though! My goal for the new year is to dive into alternatives to the iDevices, and to share my learning with you! Today I purchased a Samsung Galaxy Tab 4, 8inch version. My favorite iDevice to use is the Mini so I purchased the Galaxy Tab 4 that was similar in size and memory. The 7inch tab was cheaper but only had 8mb of internal memory! The other tablet I considered was the nabi DreamTab, but it wasn't in stock at my local store. I had an Android smartphone before I became addicted to all things Apple, so using the device and app store was familiar to me. 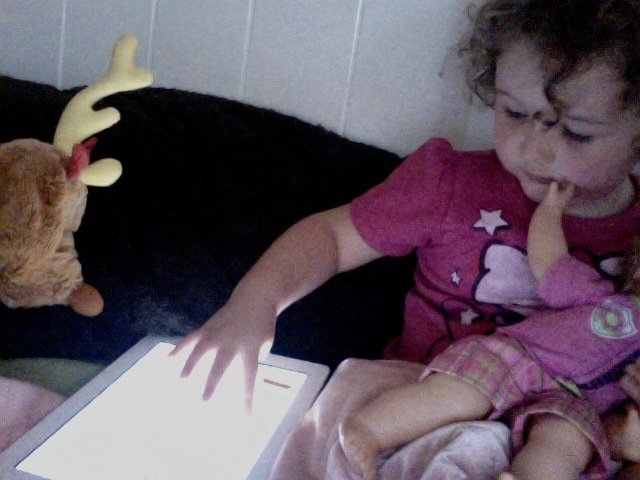 My kindergartner has already nabbed my new tablet so I know it will entice my students just like the iPad does. My biggest concern upon opening the box was how would it compare in quality and quantity of applications available? So far I've located some apps I use on the iPad- mostly games, play apps, and productivity apps. I'm downloading free and lite versions for now- I'll start exploring unfamiliar paid apps after I've tapped out the freebies! 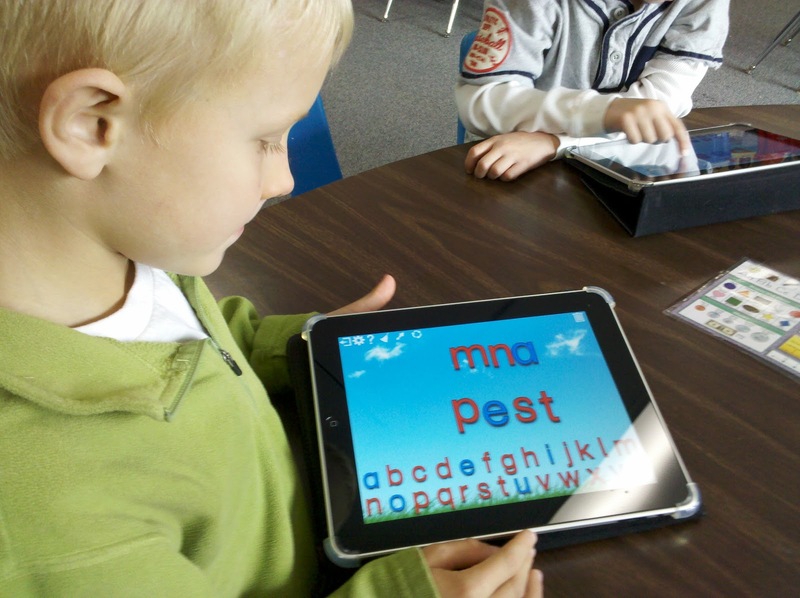 ABC Mouse has a few apps- two CVC books and their ABC Mouse learning portal app. Starfall has their family of apps available, with the Free Starfall More app offering several activities. There are play apps available by Toca Boca, My Playhome, Dr. Panda. There are lego apps as well. We especially like the Story Creator. Evernote and GoogleDrive are available to help teachers out. My biggest disappointment in the Android tablet so far is that Flash websites don't work on it like they used to. Now, like the iPad, Flash is unavailable so some of my favorite websites won't work. So... my main reason for giving other tablets a benefit over the iPad is gone. I have a Surface computer/tablet, that does allow me to use Flash websites, but the operating system and navigation aren't as easy as regular tablets. The surface looks like a tablet but acts like a computer. Does it have forward and rear facing cameras? Having cameras are important for classroom use. The camera is a powerful tool for reading and math skills, vocabulary development and storytelling. Definitely make having a camera on the device a priority. Does the device have a wide range of apps, especially open ended apps available? 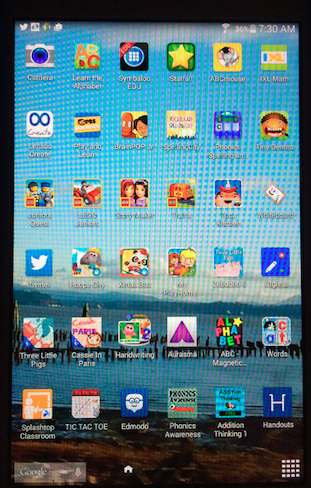 Some devices made for children require a subscription, or come with a handful of learning apps that are primarily skill practice. 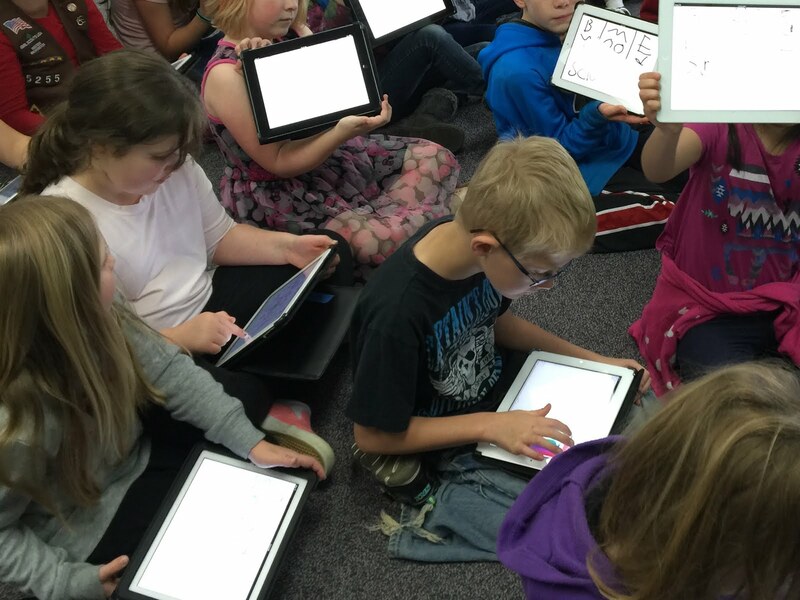 Having a variety of apps, at reasonable prices is important for classrooms. 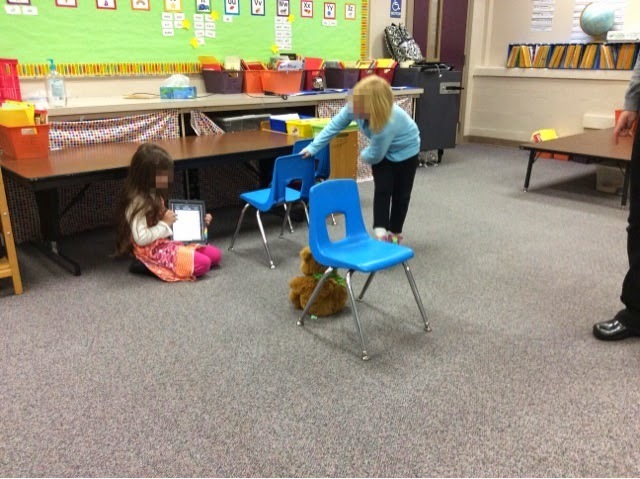 The best apps are those that allow children to create, tell stories, document and share learning. Please let me know what tablet you're using... What are it's pros and cons? Your favorite apps? One of the most common questions I am asked is "How did you pay for your iPads" or "Do you know of any grants to get iPads (or other technology) into my classroom?" 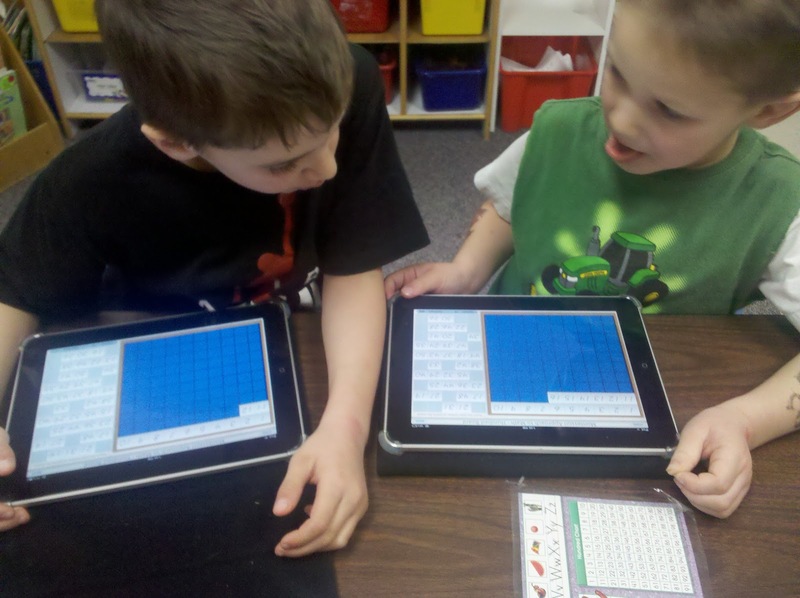 "I am requesting 3 to 6 iPads to use with my 26 kindergarten students. I use the three computers in my classroom on a daily basis; the kids are very engaged in the learning activities available. In addition to some programs on disc I also utilize multiple websites that reinforce skills we are working on. My students intuitively touch the screen when they use the computer and I think that the iPad is ideal for kids of this age. My students use computers/would use the iPad daily at literacy and math center time (6 kids share 3 computers currently) and at choice time. Using computers/ iPads allow my students to work independently on important skills while I differentiate instruction to meet the needs of the diverse learners in my class. NOTE: I did buy this app as it was featured in Apple's iPad commercial but almost immediately deleted it. As a learning to read, count and handwriting app it was no better than a worksheet. There are multiple other applications I’d be interested in: such as Super Why, Tangrams, and I am sure I’d find more once I start exploring the app store." NOTE: most of these apps are not on my 'favorite' app list as my criteria for what makes a good app has changed so much since I started using the iPad. From the original list the only one I really use is Pocket Phonics. At that time we were spending about $50 per student for consumable reading, handwriting and math workbooks. Every year we bought packages of dry erase pens, and every few years new boards. I totaled those costs up for 5 years and compared it to the cost of purchasing more iPads, and the handful of paid apps I wanted loaded on the iPads. I explained how handwriting on the iPad offered support for children and helped them individually work on proper formation at their own pace. The apps I wanted to buy and had found for free gave students opportunities to practice and learn skills with support, at their own differentiated level of learning, and at their own pace, unlike worksheets. After using iPads for years now I would also explain how many of our learning goals would be met by using the iPads. They help me do authentic assessments and share those with parents. 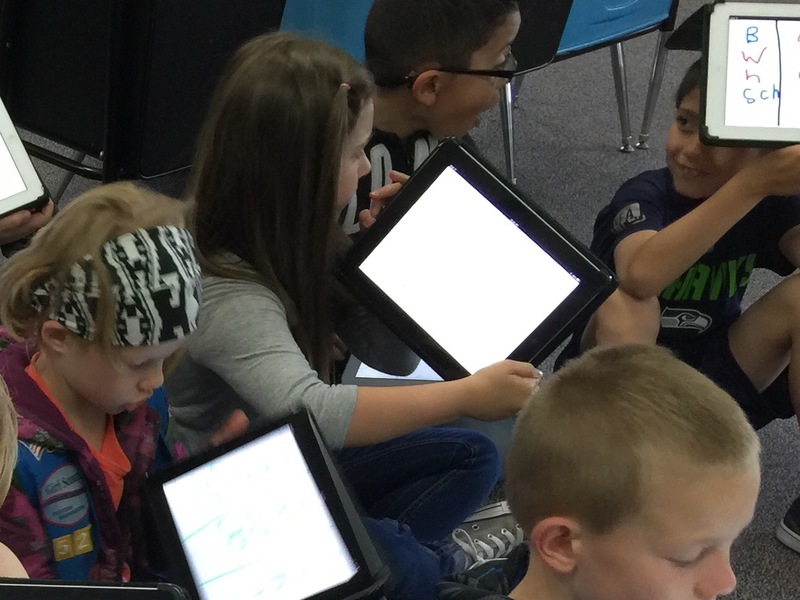 So how can YOU get devices for your classroom? 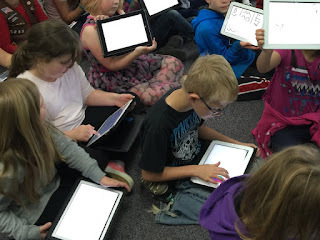 Many teachers have told me they have had great success getting iPads donated through DonorsChoose.org. Others have set up GoFundMe accounts and asked family and friends to donate. You can ask families of students and your own circles of friends and family to donate older devices when they buy new (keep in mind old iPhones can be used as iPods!) When all else fails, buy one for yourself- get a good cover- and teach with it and let the kids use it. You won't regret it! I've mentioned before if money is a constraint (and when isn't it, really?) go for the iPad mini's over the full size. They do everything the full size iPad does and cost less! Have you 'Liked' Facebook yet? Just in case you haven't, follow the link... this busy iPad loving teaching momma is much more likely these days to post information about how I'm using apps or free apps on Facebook- it's just so much easier! And it's more interactive! Pop on over there today and 'like' A Digital Kindergarten on Facebook. Speck Products one lucky winner will get an awesome Speck Case! 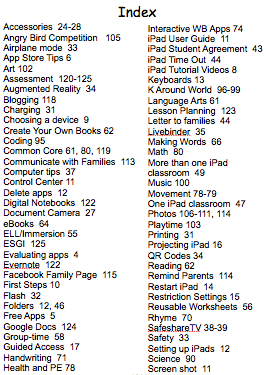 A few notes from Mobile Montessori, an app developer who contributes codes to giveaways and seminar attendees often! Our new website:http://www.mobilemontessori.org. Browse through everything we have, easily. Be sure to enter by 12 am ET on March 31st! If you're in dire need of an iPad 101 session, here's a playlist by GeorgetownISD that will help you tremendously! because while it may be simple enough a toddler can use it, us adults need all the help we can get! https://www.facebook.com/adigitalkindergarten 'like' it! I will have extra codes to share for free apps after today.